Toss sweet potato ribbons with a tiny bit of olive oil and salt. Brush a little bit of oil on each crust or flatbread and rub it with the open side of a ½ clove of garlic. 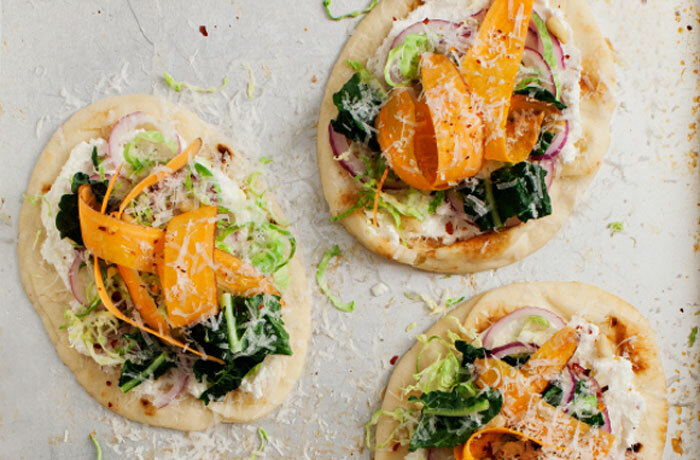 Top each pizza with a slather of ricotta cheese, a few slices of red onion, a few shaved brussels sprouts, kale and a few ribbons of sweet potato. Top generously with grated cheese and bake for about 20 minutes or until the sweet potatoes are tender and cooked through. (tip: check after 15 minutes – if the sweet potatoes are cooking slower than the other veggies (and/or your pizza crust), cover loosely with foil).